ST PATRICK'S ATHLETIC, fresh from reaching the FAI cup semi-finals, recorded their first Premier Division win since July 23 thanks to a disciplined display against ten-man Drogheda United last night. Goals from Keith Fahey, Paul Keegan and Mark Quigley were enough to secure the three points for the Saints and effectively end Drogheda's faint title aspirations. Remarkably, each side included a Paul Keegan in their line-up. The Drogheda man made the game's first mark in the fourth minute when he tested St Pat's keeper Barry Ryan with a 30-yard drive. Six minutes later, the Saints had the lead thanks to a pin-point free-kick delivery by Fahey from 35-yards that came down off the underside of the crossbar before crossing the line. 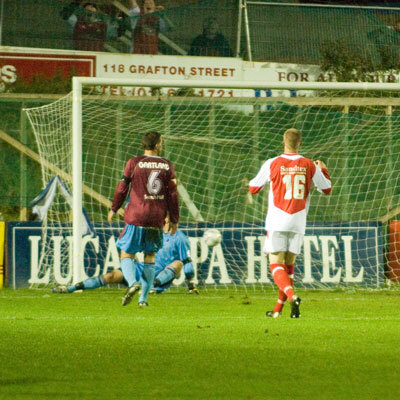 After having his contract terminated at Drogheda during the summer, it was a goal Fahey would have relished. Fahey almost produced a second for the Saints' Paul Keegan in the 14th minute but the striker headed over on the stretch from the dead-ball delivery. Mark Rutherford wasted a chance to extend the St Pat's lead in the 28th minute after shooting tamely wide from eight yards out after a long throw-in by Anto Murphy dropped to his feet. A goal-line clearance by Stephen Brennan four minutes into the second half kept the Saints ahead after Shane Barrett got his head to a Shane Robinson cross a split-second before Ryan. Drogheda's Keegan then passed up another chance in the 67th minute when he shot over from the edge of the box from a Robinson cross. 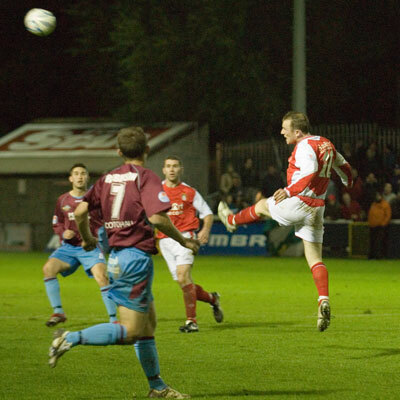 Within two minutes the visitors were reduced to ten men when Jason Gavin received a second yellow for a foul on Trevor Molloy and was ordered off. Substitute Eamon Zayed was denied an equalising goal in the 74th minute with a strike that Ryan did well to tip over. The home side grabbed the crucial second goal with ten minutes left when substitute Mark Rooney slipped in Dave Mulcahy and when his shot was saved, Keegan tapped home the rebound. Substitute Mark Quigley wrapped it up in the 90th minute with a neat finish from the edge of the box.